Suncoast Clinical Research is very active in our local community. Below are some of the local events we support as well as awards and recognition for our contributions. PEDC Service Industry of the Year winner in 2000 and 2011 – Suncoast Clinical Research has been recognized twice for its exemplary growth and economic contributions in Pasco County. 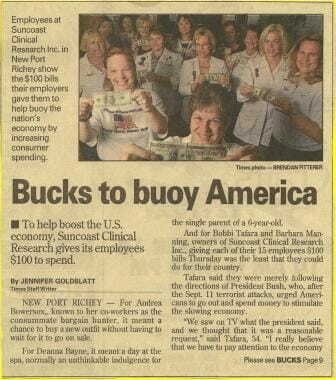 Bucks to Buoy America – Suncoast Clinical Research received national attention for its local initiative to help the economy. What a wonderful group of people working here. Love them all. Thank you for your kindness, caring and acceptance!